The Angelayo is a selection of the best barrels, at the level of great cult wines, only much lower in price. For the moment at least! So it might be a good investment to put some Angelayos into your cellar now. In contrast to the Tintórico, the Angelayo price is a function of the market and may rise considerably! The Tintórico is the main wine, always on the level of International medals, and by principle stays below € 20,- retail price, no matter, if its actually too inexpensive for the quality. Every wine drinker should be able to afford a bottle of Tintórico, at least occasionally! The inexpensive Bodegano is an astonishingly good beginner wine respectively every da house wine for wine drinkers, who don´t spend so much money for wine. The Rosado trocken (dry) is a colour intensive and versatile Rose Wine, very moderate in price, fitting to almost all dishes from sea food to steak. 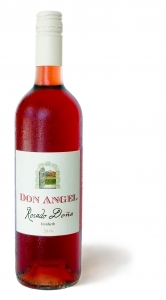 The Rosado Doña is the semidry sister of the Rosado, very moderate in price, also like the Rosado trocken fitting to almost all dishes from sea food to steak. 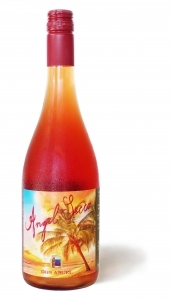 The AngelSecco is a healthy refreshing beverage for a very moderate price with natural bitter aromas on the base of the Rosado. Mixed with clear lemon lemonade or mineral water with gas, ice and some pieces of fruits, – from one bottle you will get out 6 glasses a 250 ml AngelSecco Spritz. The Blanco trocken (dry) is a typical Spanish white wine, very moderate in price, made from fully ripe grape material, with almost no residual sugar, but full of the aromas of fruits of Southern countries. Due to the low acidity and the fully ripe grapes it does not taste very dry. The Blanco Doña is the semidry sister of the Blanco,very moderate in price, made from fully ripe grape material, with only around 6 g/l residual sugar, and like the Blanco trocken also full of the aromas of fruits of Southern countries. Due to the low acidity and the fully ripe grapes it does not taste dry, but semidry. At wine the handling of only a few bottles is a big cost factor. That´s why we have a discount scale for consumers, which begins already at 24 bottles. Shipment within Europe free, to other countries according arrangement.